Happy birthday Karen Cushman (Catherine, Called Birdy). It’s the birth date of Edward Stratemeyer (1862-1930) The Rover Boys series, Robert Lawson (1892-1957) The Story of Ferdinand, Rabbit Hill, and Julia Cunningham (1916-2008) Dorp Dead! . Happy birthday Dinosaur National Monument in Colorado and Utah, established in 1915. Read Dinosaur Mountain: Digging Into the Jurassic Age by Deborah Ray. The first public elevator, in London Earl’s Court metro Station, begins operation in 1911. Read Charlie and the Great Glass Elevator by Roald Dahl. In 1957, Sputnik I, the first artificial satellite to orbit Earth, is launched by the U.S.S.R. Read Laika by Nick Abadzis. On a related note, World Space Week starts today. It’s Ten-Four Day, in reference to radio operators’ affirmative utterance. Read 10 Minutes Till Bedtime by Peggy Rathmann, and Four Perfect Pebbles by Lila Perl and Marion Blumenthal Lazan. And for those so inclined, it is Cinnamon Bun Day in Sweeden. 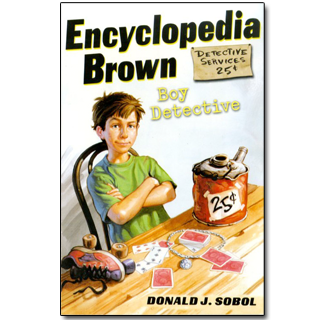 But in 1963, shortly before his fortieth birthday, Sobol published the first of the books that would make his fame and fortune, Encyclopedia Brown: Boy Detective. This book, like the sequels that would follow, contains ten short but exciting stories about Leroy Brown, son of the police chief of Idaville, Florida. Leroy is nicknamed “Encyclopedia” because of his vast knowledge, and receives help or hindrance from Sally Kimball, his Watson, or Bugs Meany, his nemesis. In each story the reader is asked to solve a mystery or question by logic, observation, or deduction. Ideal for readers not always enthusiastic about books, the stories have some of the same appeal as Sherlock Holmes sagas. They are fun but tricky at the same time. In the back of the book, the solutions are presented so the child can test his or her answers against the author’s conclusions. Chapter 3, The Case of the Civil War Sword, is particularly appropriate for the Sesquicentennial of the Civil War, beginning this year. A boy wants Encyclopedia to verify if a sword really belonged to Thomas Jonathan “Stonewall” Jackson. It is inscribed: “To Thomas J. Jackson, for standing like a stone wall at the First Battle of Bull Run on July 21, 1861. The sword is presented to him by his men on August 21, 1861.” No problem for Encyclopedia—nor should it be for any Almanac reader of the July 21 entry on the Bull Run Battle. The most important thing that any reader starts to learn in these books is just how much fun can be had in the pages of a book. How cool is that? Donald Sobol died this year but I hope everyone can honor him today by reading one of his books. For almost fifty years young readers have been drawn back to books again because of his fictional creation, Encyclopedia Brown. Originally posted October 4, 2011. Updated for . 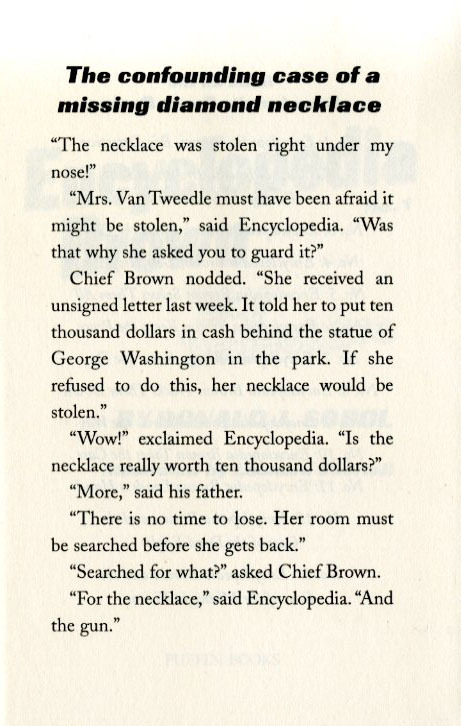 Thanks for highlighting Encyclopedia Brown today. Very fond memories of getting these books from the Scholastic book flyers when I was in elementary school! I didn’t get a chance to chime in with the book lists yesterday, but today’s post is perfect because Encyclopedia Brown would have been on them. I have clear memories of checking these out over and over again each week at the library while I waited for my little sister to finish swim lessons at a nearby YMCA. I loved trying to solve the mysteries – Encyclopedia made it cool to be smart! Great shout-out to 10 Minutes Till Bedtime too, one of our favorite bedtime stories – amazing detailed and funny pictures that my kids love to pour over. Oh, how I loved these books when I was a kid!! I have so many memories of sitting under (or in) the apple trees on our farm and reading these books. I loved trying to solve them on my own and then checking the solutions in the back to see if I was right. We need MORE books like these…books that celebrate smart kids, show they can be heroic by using their brains, and show that being smart is cool. Star, you might like the Eric Berlin books–The Puzzling World of Winston Breen and The Potato Chip Puzzles. I loved sharing these with my smart son! Fun for the whole family. There is a great story about a boy I babysit many many years ago. His 3rd grade class had the classic assignment of writing to an author. The class unanimously chose Donald Sobol because the teacher had just read it and all had enjoyed. Patrick was impatient with everyone writing to the same author and wrote to Robert Graves because he had found Goodbye to All That at home and devoured it. Guess what – he got a handwritten and lovely response from Greece or somewhere exotic while some but not all of the rest of the class got a form letter (and some got nothing). When I worked at Penguin and occasionally helped sort the author mail, I was amazed at how foolish these teachers were not to better assist with addresses. We couldn’t even guess whom some letters were for. Or what to do with letters addressed to Black Beauty! I like this website,very nice story`…..i love this!!!!!!!!!!!!!………………………….. I still read these to the 4th & 5th graders in my school library. I choose one mystery to read aloud and then ask them to figure out the solution. The resulting discussions are fascinating! And of course the books just fly off the shelf after that, since whoever figures it out feels like a real detective and whoever didn’t is sure the next case will be easier to solve! I loved to read them when I was a boy.